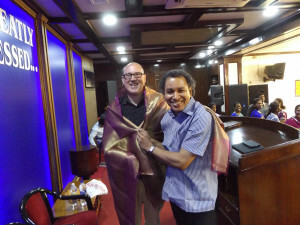 As we arrived at New Life Church (Avadi, in Chennai) the service had already started and so we were ushered inside. As we walked through the entrance we came across about 200 plastic chairs under a roof all facing the front and the place was already fairly full. Then I realised that this was just the overflow. When we walked into the main church building the room was packed with over 400 people. After the service I discovered that there was a meeting room directly above us, of the same size, which was also full of people since the service was relayed up there through TV screens. So, all up, there must have been somewhere between 700-1000 people there. And that was only one of four services today. 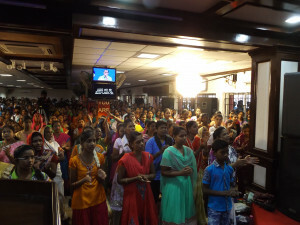 Pastor Jacob Koshy estimates that, if everyone who attends New Life Church turned up together there would be about 7500! It was such a privilege to preach in this lively service. The atmosphere was relaxed and informal – lots freedom for people to express themselves – some dancing and laughing, and generally engaging with whatever happened in the service. It was very exciting to see how passionate the people were about following Jesus. Pastor Koshy is dearly loved by all and his charismatic personality is clearly part of the reason why the church has grown so big. To be fair to him, before I preached he told the church that he was not going to be so involved in the services and asked them not to expect him to do everything but to be content when the other Pastors take part. So he is not encouraging the hero worship. It was quite a phenomenon though. I thank God that almost all church members come from the local area. There is a real expectancy that God will impact the community around Avadi through the gospel of Jesus Christ, and I give thanks God for that. Wow, you are indeed a celebrity for the Lord and I’m sure the children of God see you now as their role model leading their paths to Jesus. Thank you for your obedience to the word John, and we’re blessed to have you back. As they say, there’s time for everything. Time to be on Sabbatical and time to return home where your own sheep are waiting for your return impatiently. A little more patience Annie – I will be back in just over a week!